On leaving academia. Hello Career? So I just spent the past [too many] years of my life in academia at the big institutions up and down the Charles River. And then I just did a job search and landed a job: an enormously non-trivial task summed up in one short mini sentence. Lol STEM shortage, lol higher education, lol advanced degrees, lol biomedical research. There is a large gap in distribution between topics with open positions in academia and industries with open positions outside. Consider that in life sciences (and likely others, although I am less familiar with others) the percentage of graduate students that do go on to tenure track faculty positions sits at < 10%. That is agnostic of other factors such as how prestigious is your institution and PI or if you happen to get into the next big thing. By and large you are > 90% likely to have a career outside of academia. Within academia, life sciences trainees and non-life sciences trainees alike are funneled into biomedical research projects (figure 1). 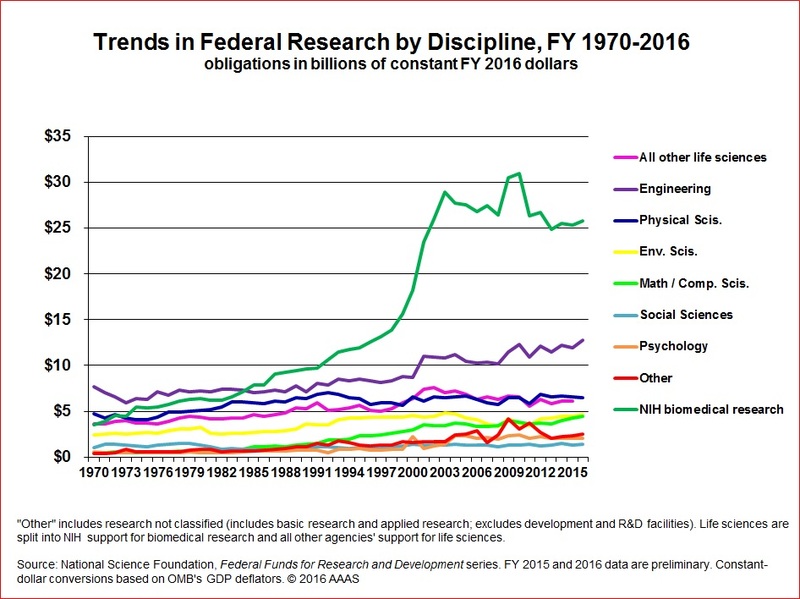 Likely because biomedical research garners the most federal funding dollars plus lay public warm fuzzy feelings. And then > 90% of those trainees finish and have to look for careers… Doing what? Figure 1. AAAS federal funding distribution for sciences. Apply for biopharma jobs aka “go to industry” lol. Where hiring managers immediately pop academics’ CVs straight into the electronic trash. Because no experience. Because you think you’re so smart because Fancy Lineage – Prestigious Institution – All The Awards – Famous PI. Perhaps it wasn’t this hard 10 years ago (I don’t know, but see historical trend and NIH bump in 2000), but it certainly is now. Hundreds of life sciences trainees are applying for every open job posting :(. So how to have a Career? First, the biggest barrier to entry is your attitude. Unless you were doing something directly hot and translatable like clinical work in immune-oncology or CRISPR starting 5 years ago, you’re going to have to be adaptable and learn new things. Your thesis topic is likely of no interest to anywhere in industry. In fact, your thesis topic doesn’t really matter. Your biggest marketable asset is that you are smart enough to learn and can do a project(s). The main value of your PhD (or MS or postdoc) is technical experience that says you can do a project(s) and are smart enough to learn. Second, ask for help with how to find a career and listen to all that advice. Read books and career websites. Keep asking for advice. Advice from people out there that is, with or without PhDs. Talk to strangers through the alumni network. It feels awkward to ask strangers for help, but really people have all been there and are happy to give advice even if they can’t or won’t give you a job. Take the generic advice to heart because you aren’t any better in the world than the highschool dropout looking for a job. You’re both unemployed with little to no credible work experience (sorry, but academia doesn’t count as real work experience to most people). And I don’t mean go to the Nature Career Expo and talk to other academics about “alternative careers”. The point of all the talking is not exactly to find a job, but to learn how the culture out there works. It’s crucial to learn to speak to what is considered successful out there. Learn the language people use. People out there will also help you understand and correctly word your transferable skills. They can help you figure out which direction or industry you might be able to get into that is poised to do well in the future. That direction may not be the most obvious to you and it may not have anything to do with life sciences! Analyze each conversation to figure out how you can get a more favorable response in the next conversation. The first one will be hard and likely won’t be great. Keep revising your resume. Improvement is a continual process. No matter how smart, accomplished, and well-respected you were inside – you will get rejections. Consider outside of biopharma. And not just in consulting, but high-tech, medical devices, any tech, finance, law, etc. Keep asking for help, do informational interviews, do alumni networking, learn the job titles that are appropriate for you and the career tracks within each of those industry segments, and keep at it. Even when you feel like people are just giving you hollow cheer-leading, go ahead and take it. All those people you know who went from your Big Name Institution to Industry Big Name Place or Big 5 Consulting and made it look easy? Well it wasn’t easy. They’re not telling you the half of how much they ran around, how many applications, how many people they talked to, how many follow-ups went unanswered, how many resume revisions, how many career articles read, how much practice interviewing… It’s not easy. Everybody is just pretending (me too IRL). Not sure if anyone will read this. Maybe my future self? But completely happy to help anyone else going through this process so feel free to ping me!